This week, we added 50 new images to the http://bradystewartphoto.photoshelter.com/gallery-list. 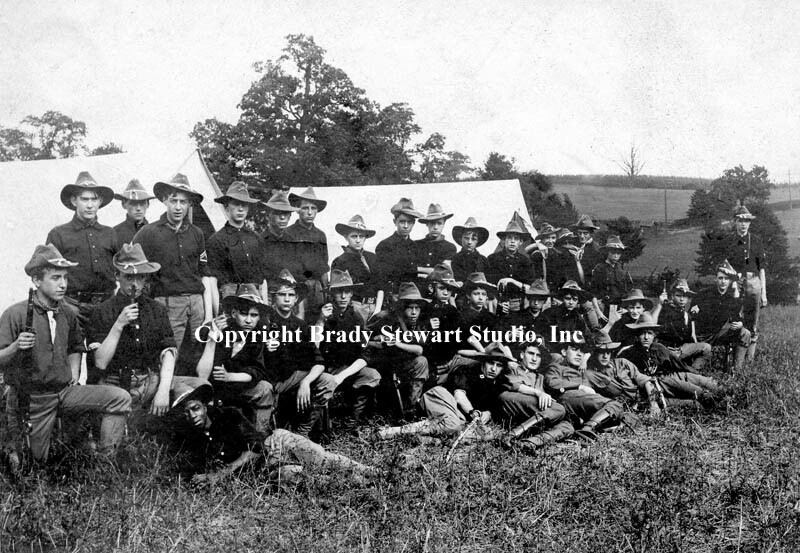 Gallery: Living In Western Pennsylvania 1900-1910. The 15 images of Brady Stewart traveling in and around the Greensburg Turnpike are special in many ways. Brady Stewart had just come through the worst year in his life due to the death of his best friend and younger brother Clark Stewart. 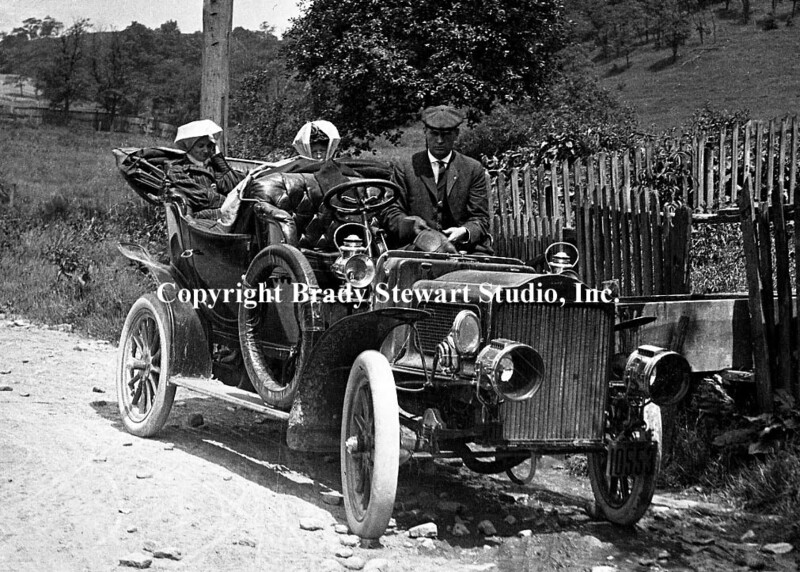 So in 1906, he purchased a new Buick Model F for around $1,300 and began to travel and take photographs all over western Pennsylvania and went to neighboring states to visit friends and relatives. 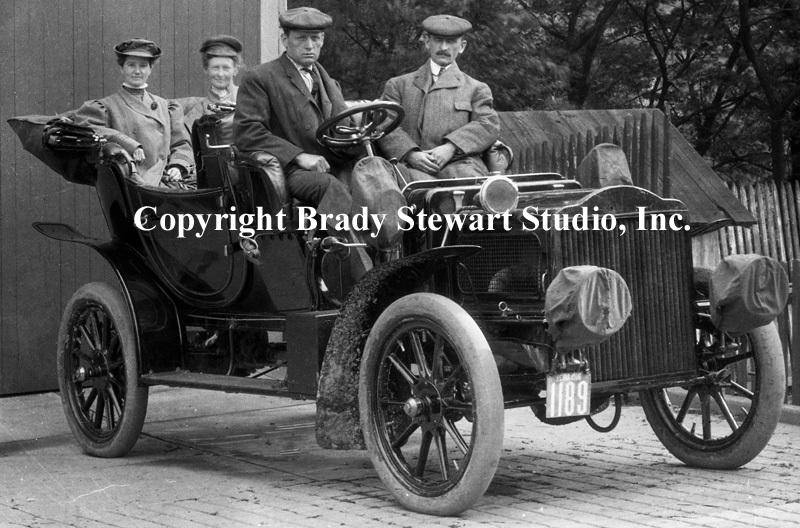 The specifications for the Buick Model F included; seats 4-5 passengers, 2 cylinder engine, 2-speed manual gearbox, rear wheel drive, 16 gallon fuel tank and roughly 20-25 miles per gallon. The photo below in Oakland before starting off of one of his trips. 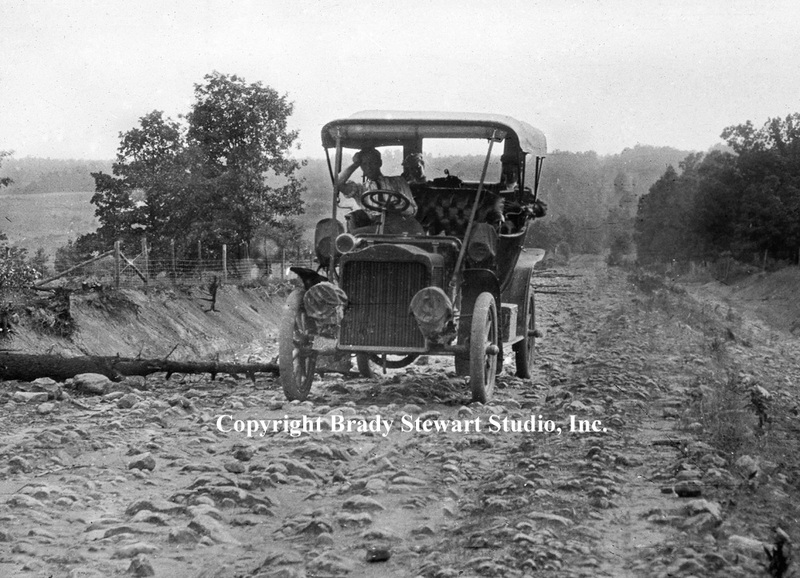 In 1906, there were approximately 79,000 automobiles on the roadways throughout the United States. Clothing manufacturers saw an opportunity to take advantage of the new craze by developing lines of “Motoring” clothes for men and women. 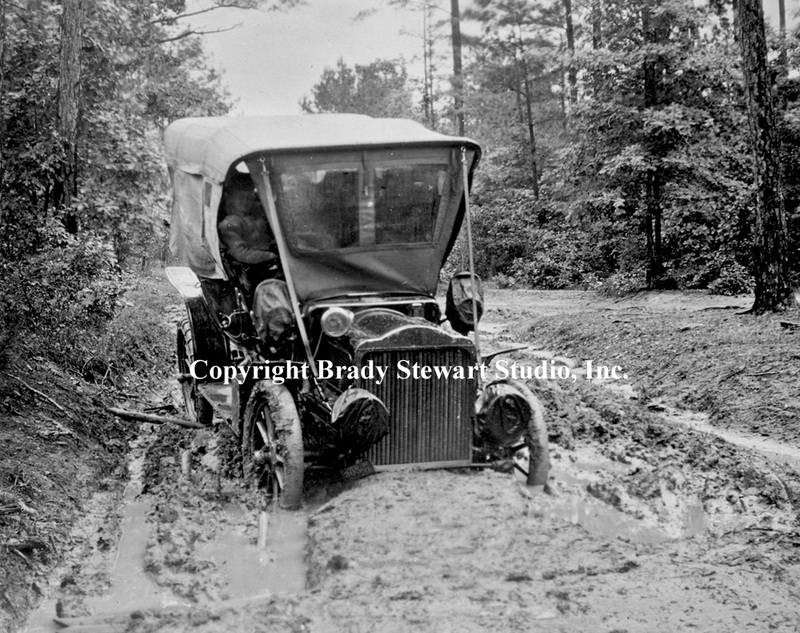 As you can see from the images, the early cars did not offer much protection from the elements. For men, there were coats, hats and gloves for driving and for changing a tire. And let’s not forgot those great goggles that you have seen in the movies. For women, there were stylish motoring coats along with specially designed face veils that covered hats and protected them from the elements. You can see examples in the photographs included in the blog and on the website http://bradystewartphoto.photoshelter.com/gallery-list. Gallery: Living In Western Pennsylvania 1900-1910. We have all experienced challenges with our automobiles but I am not sure we can imagine what it was like in 1906. To start with, there were no paved roads, highways, gas stations, and yes, no AAA outside the major cities. AAA started in 1901 but did not become nationwide until the 1920’s. Maps were first published by AAA in 1905 but they were very limited in size and scope. They started paving roads around 1915, building highways in the 1920’s, and Gulf Oil opened the first “filling station” and sold maps in Pittsburgh in 1913. 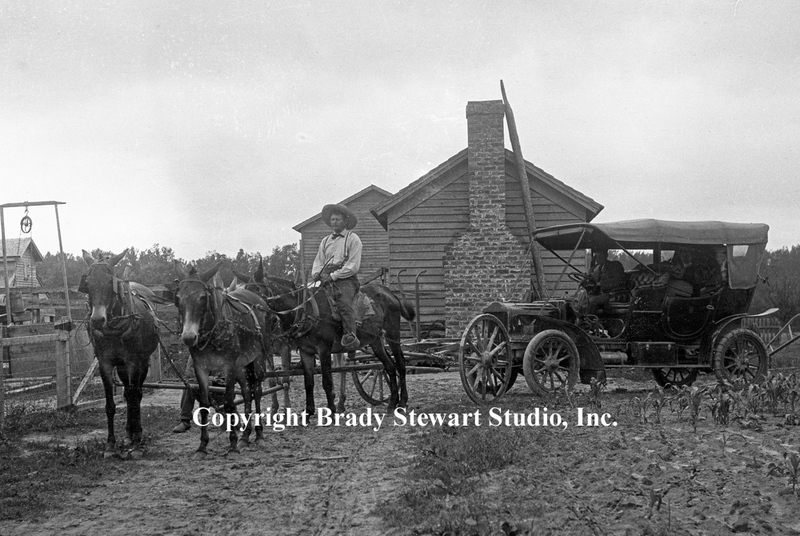 In 1906, you purchased gas from a local general store, blacksmith or pharmacy. Repairing your car could be an adventure depending on the problem; frame damage needed a qualified blacksmith, engine issues required the dealership and minor issues such as flat tires… you. And when these problems occurred out in the country… good old horses saved the day! 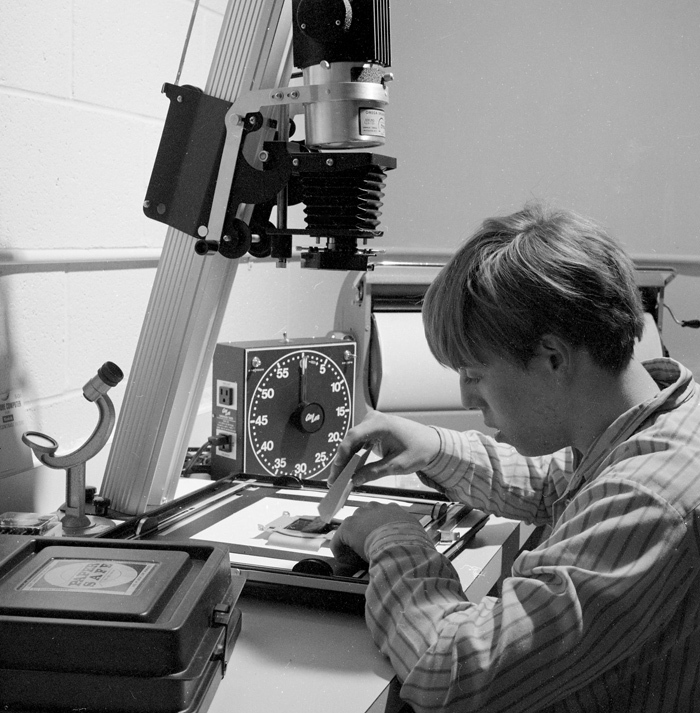 We have been busy documenting another filing cabinet full of negatives and prints. We will add many more images to the Collection over the next month. 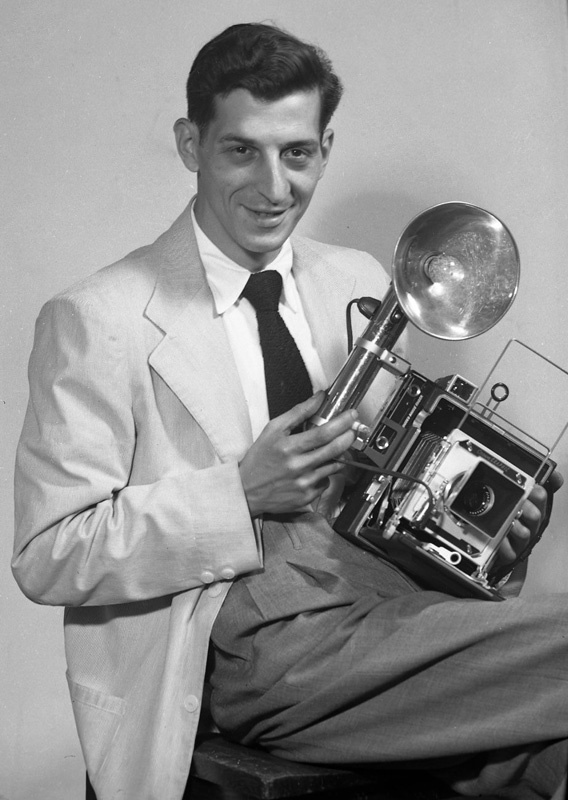 We added 11 new images to the Brady Stewart Collection Archive web site and created a new Gallery – New Images added in November 2012. 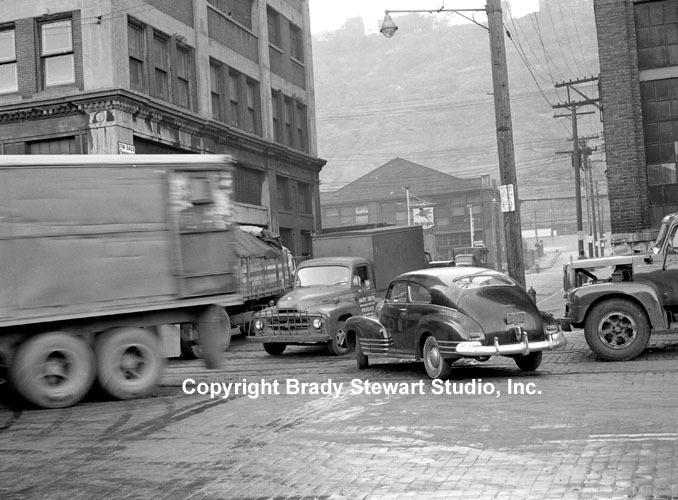 We created an additional Gallery called “The Strip District in Pittsburgh” where we included many more views of the Strip from 1925 to 1965. The new images can be viewed at http://bradystewartphoto.photoshelter.com/gallery-list. 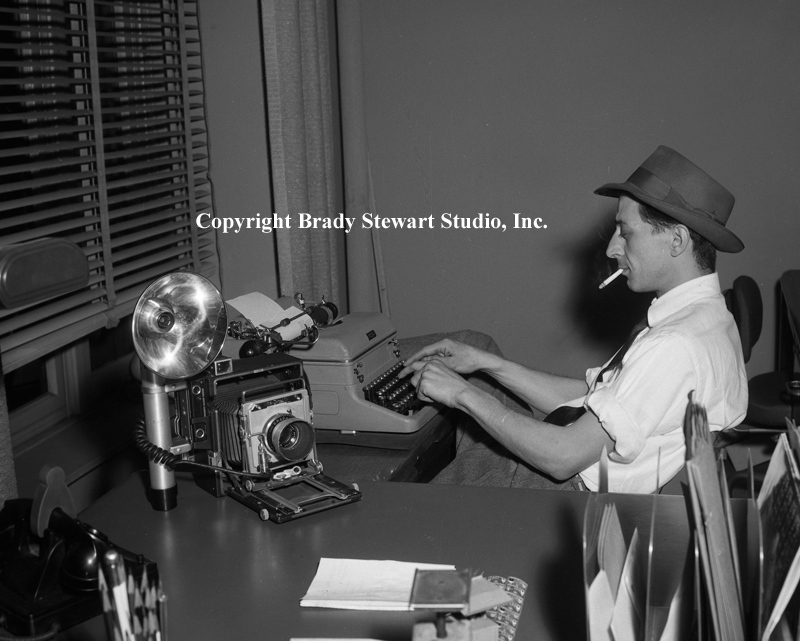 All images in the blog are copyrighted by Brady Stewart Studio Inc. If you are interested in downloading an image or to purchase a print, please contact Brady Stewart Studio by phone (724.554.9813) or email bstewartphoto@aol.com. 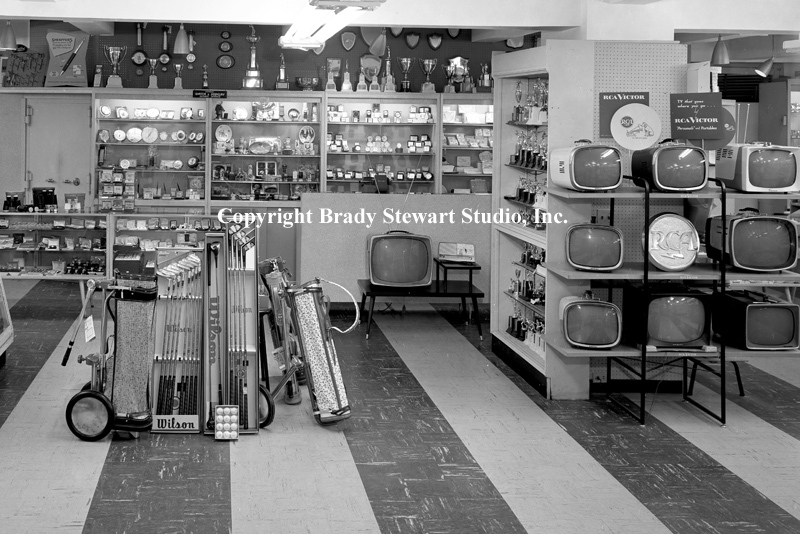 The new images include location photography of the Thorofare Grocery Store offices in the Strip District. The assignment was contracted by Commonwealth Realty to show off the Thorofare property at 17th Street and Smallman Street. Brady Stewart Jr. took this assignment and completed it on two different dates; early morning during the normal Saturday rush and Sunday when the traffic was at a minimum. 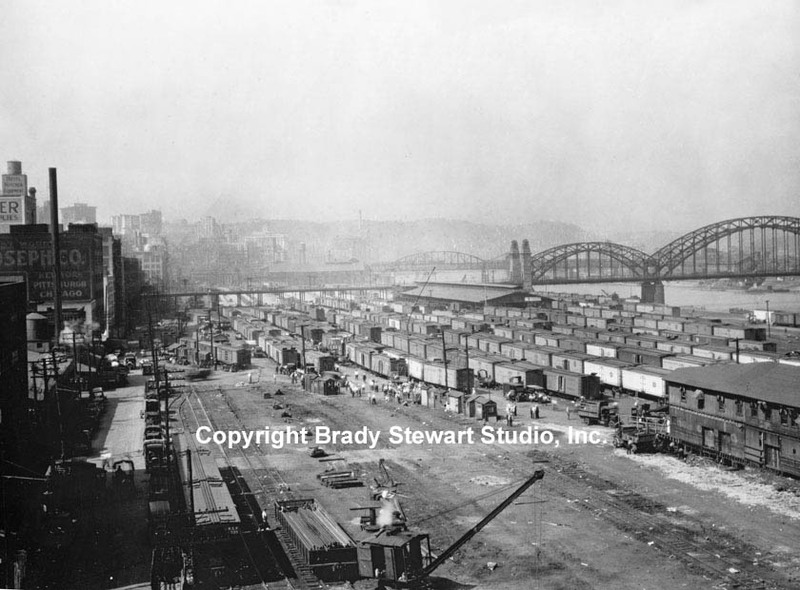 View of the Pennsylvania Railroad produce yards looking southwest toward the 16th Street bridge and downtown Pittsburgh. 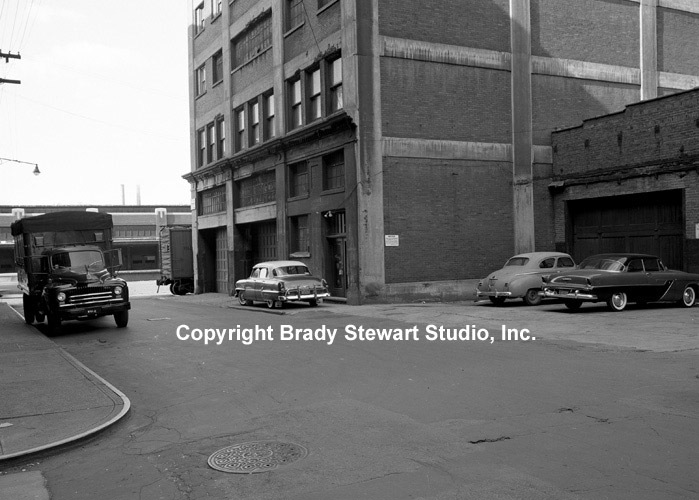 View of the Thorofare offices on 17th Street with 1953 Pontiac Bonneville in front of the door. 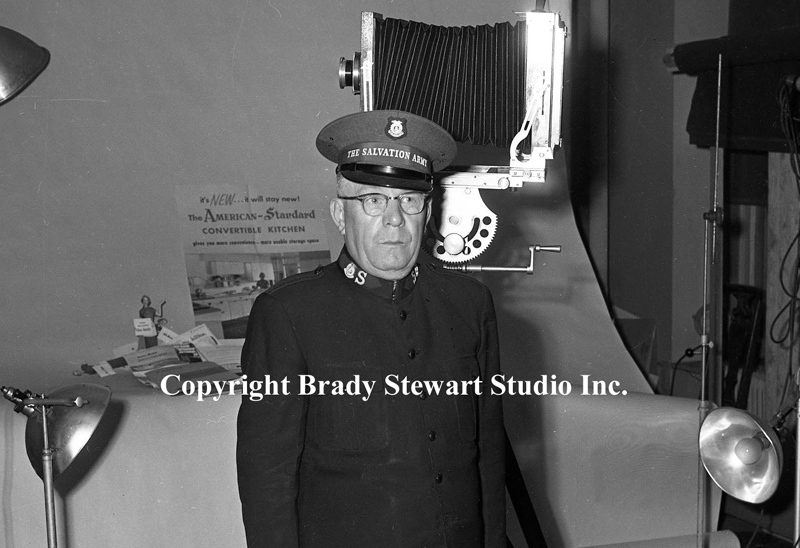 We added three images from a Railway Express file. 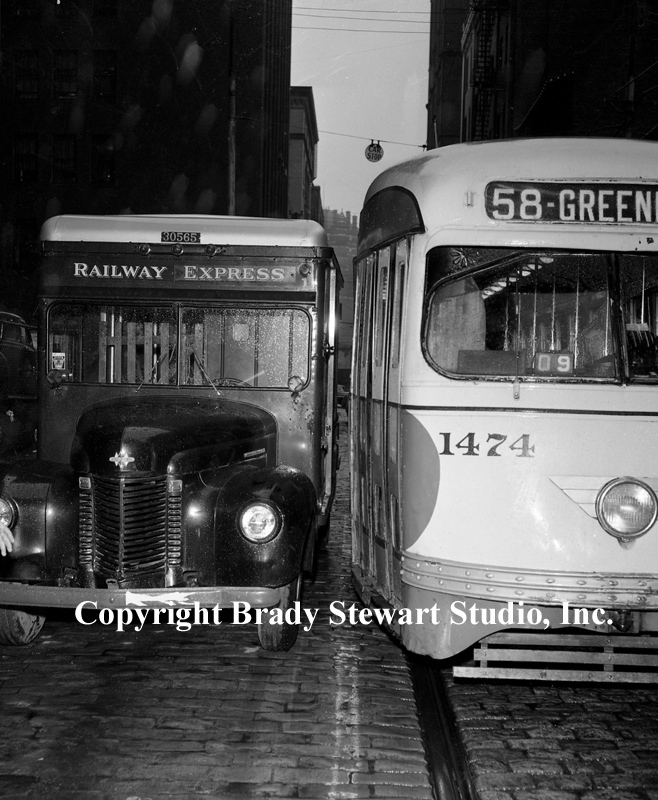 Railway Express was “the” door-to-door package delivery company in Pittsburgh for many years… similar to UPS today. Railway Express was a very good client of Brady Stewart Studio, we were on call to photograph any accident site for insurance and legal purposes. 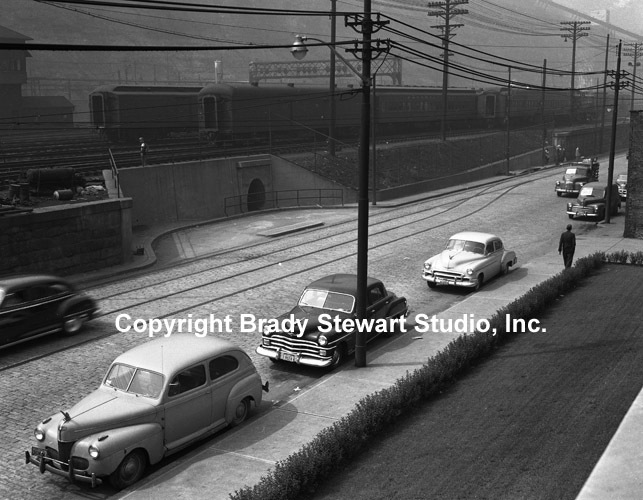 The view below was an accident near the Railway Express yard in the Strip District. The location of the accident was at Liberty Avenue and 22nd Street. We also created a new Gallery, The Strip District of Pittsburgh. 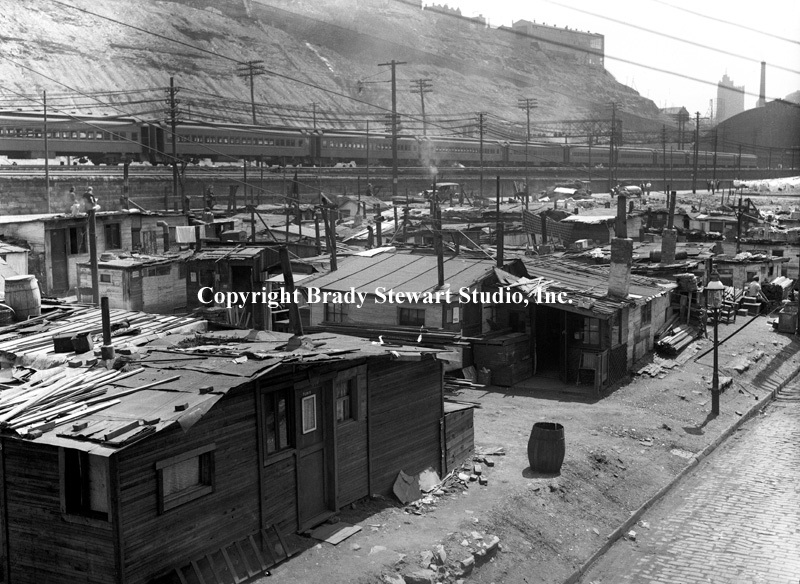 The view below was taken by my grandfather in 1925 right before the Pennsylvania Railroad built the produce yards to alleviate the traffic problems in the area. 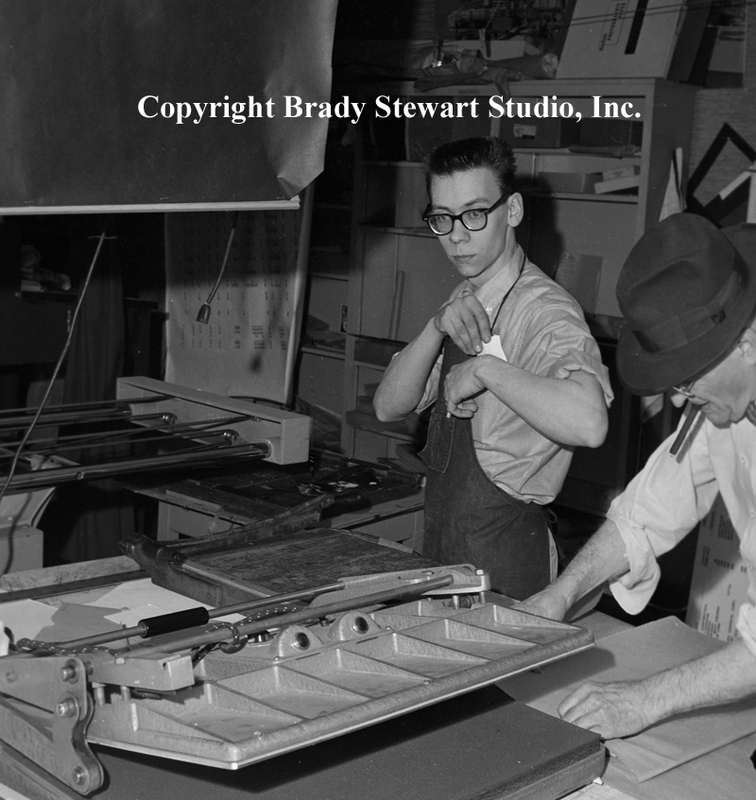 We added 40 new images to the Brady Stewart Collection Archive web site and created a new Gallery – New Images added March 13th 2012. 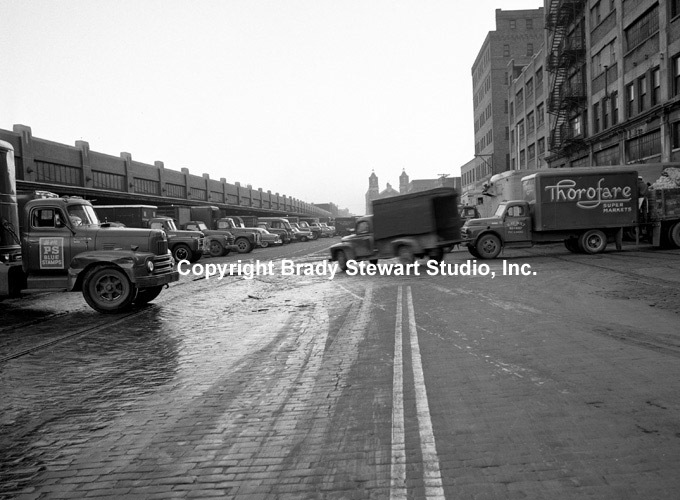 The new images can be viewed at http://bradystewartphoto.photoshelter.com/gallery-list. 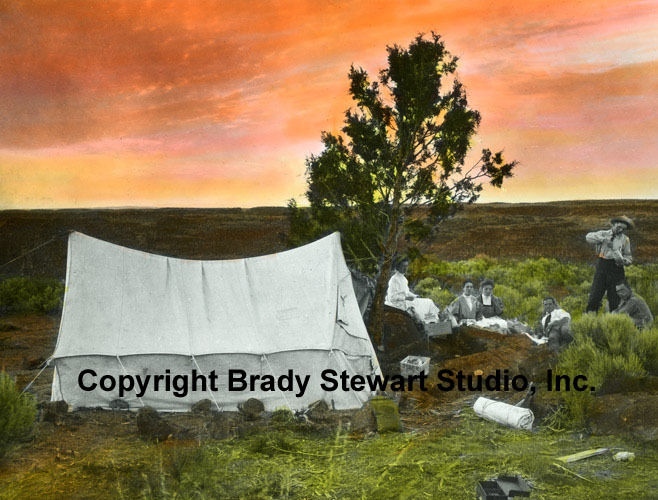 All images in the blog are copyrighted by Brady Stewart Studio Inc. If you are interested in downloading an image or to purchase a print, please contact Brady Stewart Studio by phone (724.554.9813) or email bstewartphoto@aol.com. Renaissance 1, the revitalization of Pittsburgh’s downtown, became a reality in 1946 after the election of David L. Lawrence. Mayor Lawrence worked closely with Richard K. Mellon, Chairman of Mellon Bank, to develop a plan transform the “smokey city” into a more livable and metropolitan city. Most are unaware that for over 30 years (1955-1985), Pittsburgh was home to the 2nd largest number of Fortune 500 companies… next to New York City. The list included; US Steel, National Steel, Rockwell, Rubbermaid, Alcoa, Allegheny International, HJ Heinz, Koppers, Inc, PNC Bank, Mellon Bank, Ampco-Pittsburgh, Bayer Corporation, Fisher Scientific, Gulf Oil, Joy Manufacturing, L.B. Foster Company, LTV Steel, Jones and Laughlin Steel, Mobay, Pittsburgh Steel, PPG Industries, Swindell Dressler, Wheeling Pittsburgh Steel, & Consolidated Coal. It is clear that many of the area companies along with others would not of made Pittsburgh corporate headquarters without Renaissance 1. 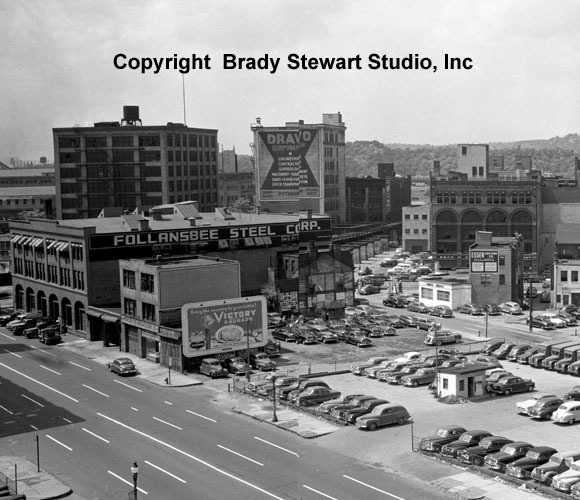 As you can see with images prior to 1950, the city was a typical manufacturing city in the rust belt; unattractive, dirty, older buildings and not very metropolitan. Since I travelled extensively for business from 1975-2008, I visited nearly all of the rust belt cities and Pittsburgh is the only one that transformed itself into a spectacular skyline. Cleveland, Cincinnati, Columbus, Wheeling, Harrisburg, Buffalo, Syracuse and Rochester are examples of rust belt cities. Harry Truman’s Housing Act of 1949 was the key piece of legislation that enabled the city of Pittsburgh to clear the blighted areas near the point for Gateway Center. The Act was of great importance in that it governed the way the financial resources of the federal government would shape the growth of American cities in the post-war era. 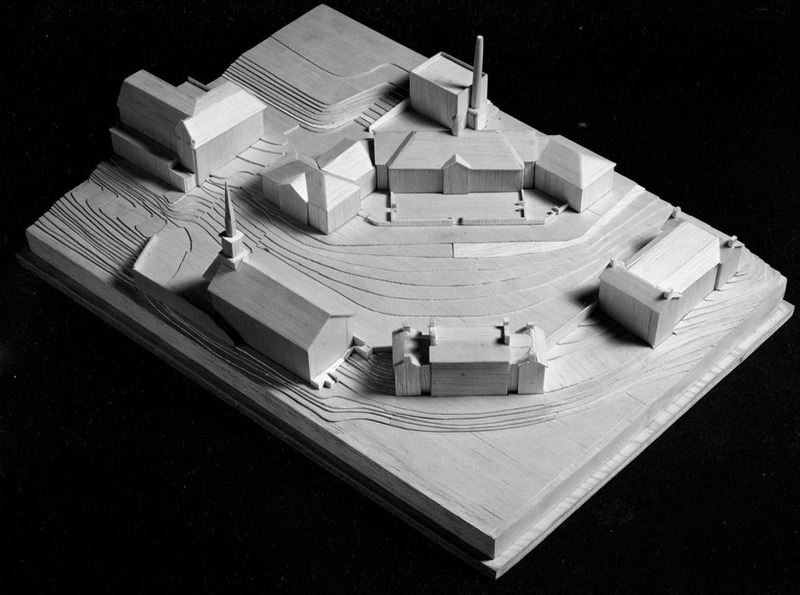 The following photographs were taken by Brady Stewart Studio in support the architectural plans of Ludgate, Lear & Company. Some of the more well-known companies displaced by Gateway Center construction are: Commonwealth Heating & Lighting, Demmler-Schenck, Rosenbloom Finance, M.A. 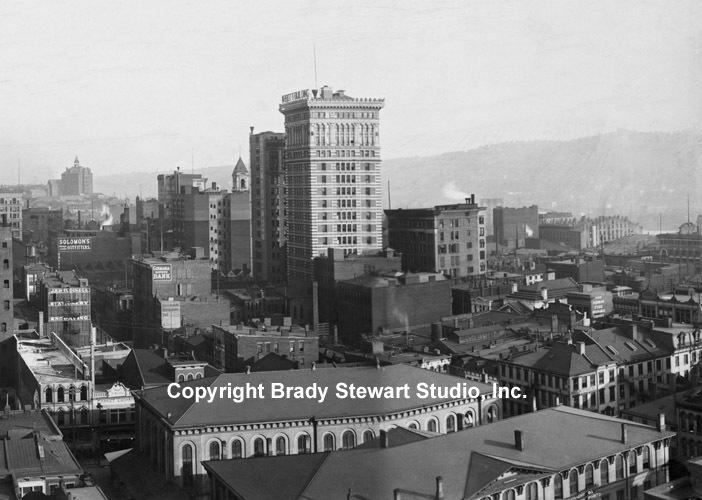 Baskind, Blaw-Knox Company, Home for Aged Women, Hotel Carr, Pittsburgh Case Sales, Heyl and Patterson, Pittsburgh and WV Railways, Follansbee Steel Company, Point Restaurant and Cafe, and Esser Costume Company. 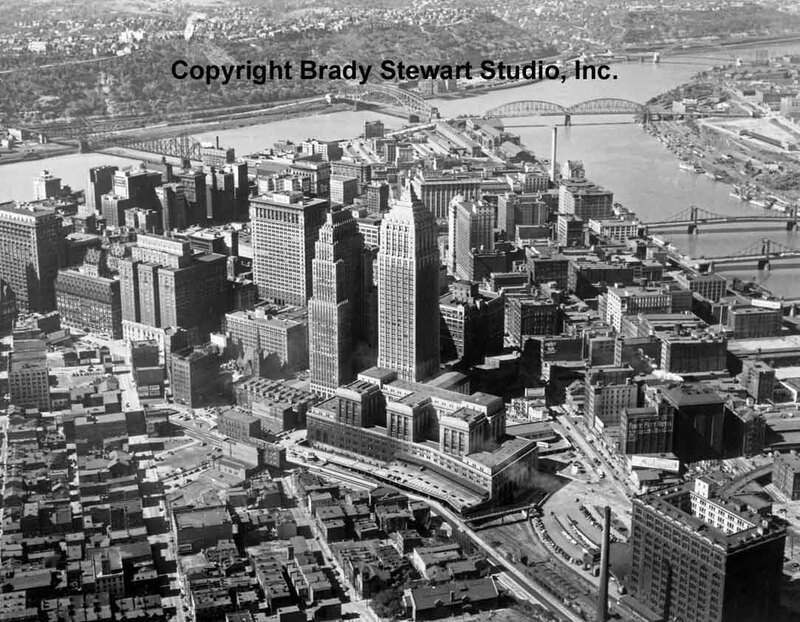 The next image highlights “old Pittsburgh” before it was transformed by the implementation of Renaissance 1 & 2. The next image is a street level view of Liberty Avenue at Fancourt Street (left) and Fourth Avenue (right). Company signs in the area include; Commonwealth Heating Company, Eppy’s Parking Lot, M.A. Baskind & Company, Demmler and Schenck Co., and the Albert Brahm and Company. The next image is a view of the point-area looking across the Boulevard of the Allies and Third Avenue towards Liberty Avenue. Company signs in the area, Eppy’s Parking Lots, Follansbee Steel Corporation, Wonderlite Manufacturing Co., Dravo Corporation, Esser Costume Company, Amoco Service Station, and a Victory Sausage billboard. 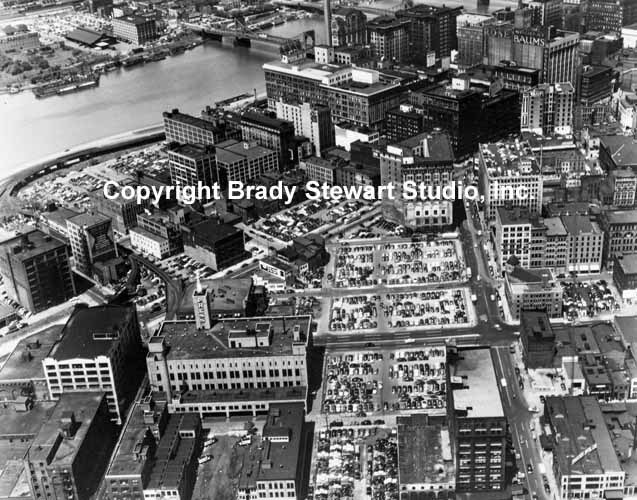 The last image is an aerial photograph of the Point-area prior to the Gateway Center Construction. The view is looking from the Monongahela River up Ferry Street toward Liberty Avenue and over to the Allegheny River. 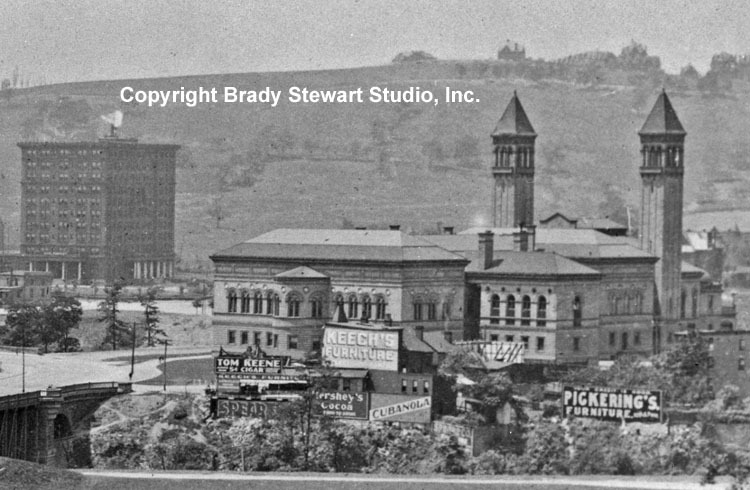 The Pittsburgh Press Building is in the foreground and the Bessemer and Fulton Buildings in the background. 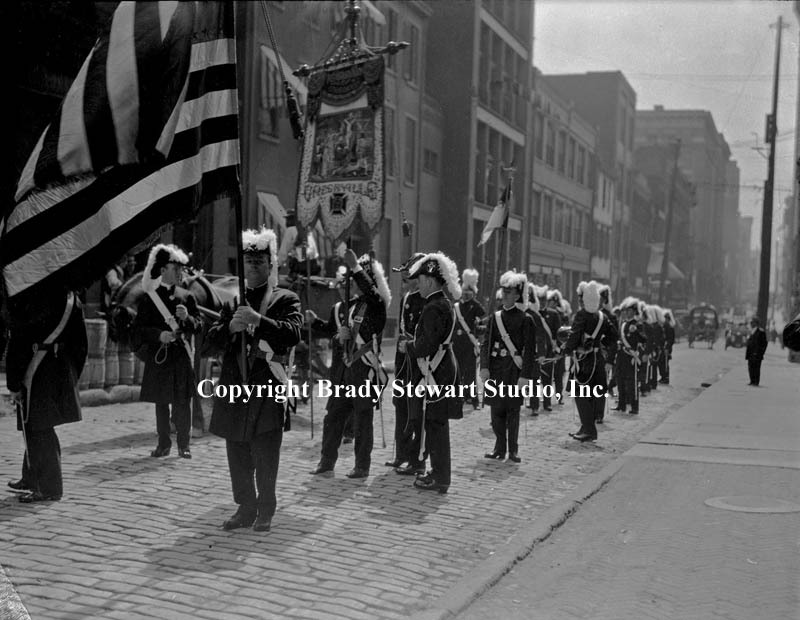 Additional images of the point-area can be found at http://bradystewartphoto.photoshelter.com/gallery-list… City of Pittsburgh Street Scenes. 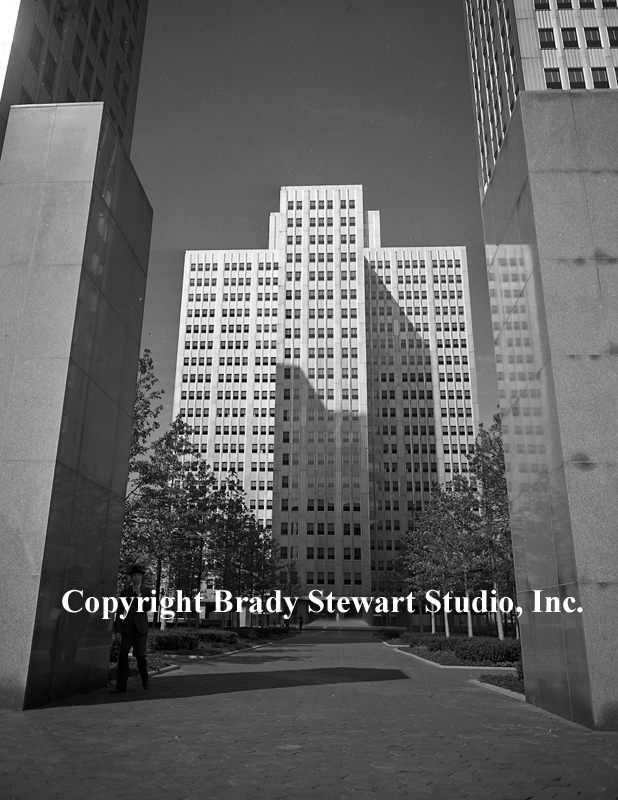 All images in the blog are copyrighted by Brady Stewart Studio Inc. If you are interested in downloading an image or to purchase a print, please contact Brady Stewart Studio by phone (724.554.9813) or email bstewartphoto@aol.com. 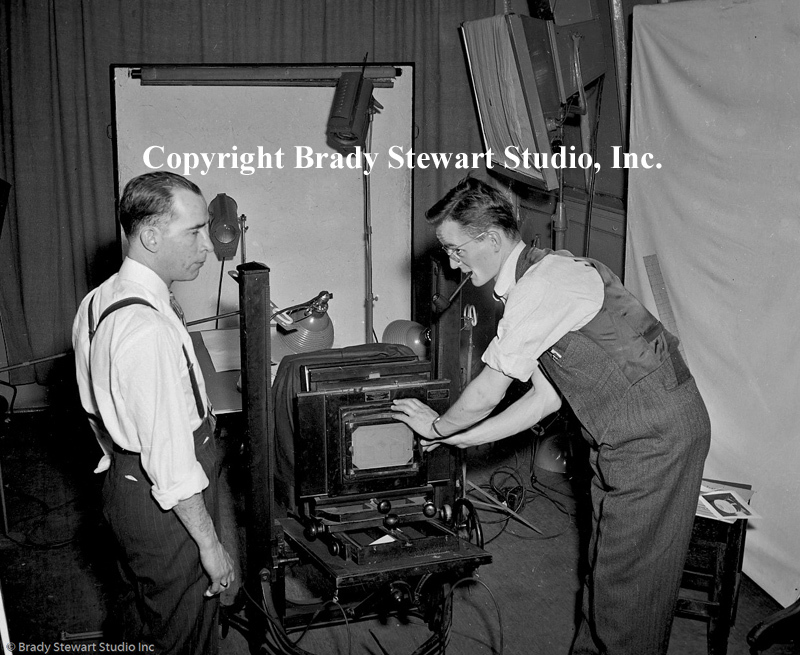 Brady Stewart started his professional photography career shooting Wabash Railroad progress photos in 1903. His next project was shooting a panorama of the city from the top of the Empire Building (1904). He used his father’s contacts (Homer Stewart, Treasurer of First Guarantee Trust) to gain access to the rooftop of the Empire Building to take the panorama. 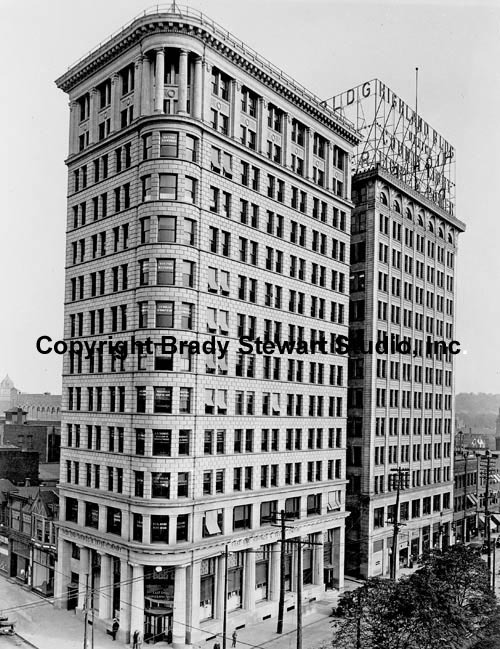 The Empire Building was located on Liberty Avenue and Stanwix Street and was situated next to the Jenkins Arcade for over 70 years. 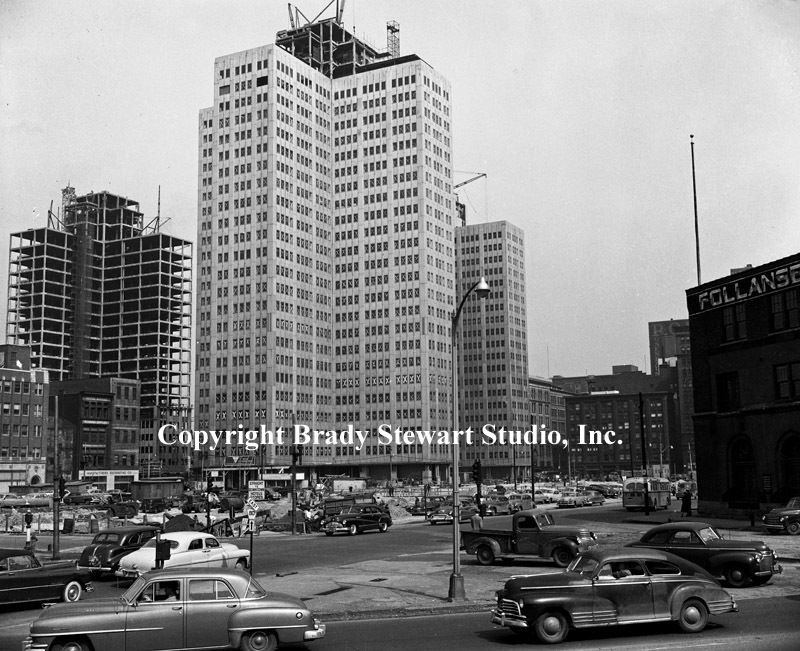 Both buildings were torn down to make room for the Fifth Avenue Place. 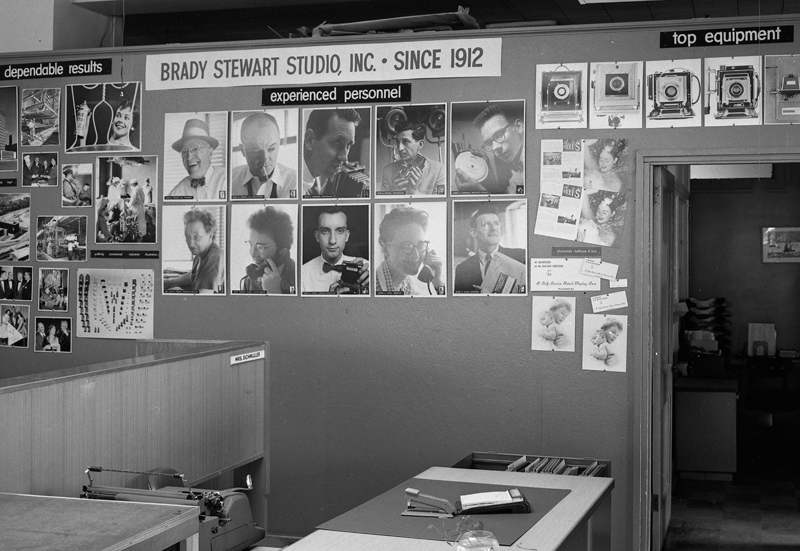 The Empire Building was also the home of Brady Stewart Studio for over 20 years. 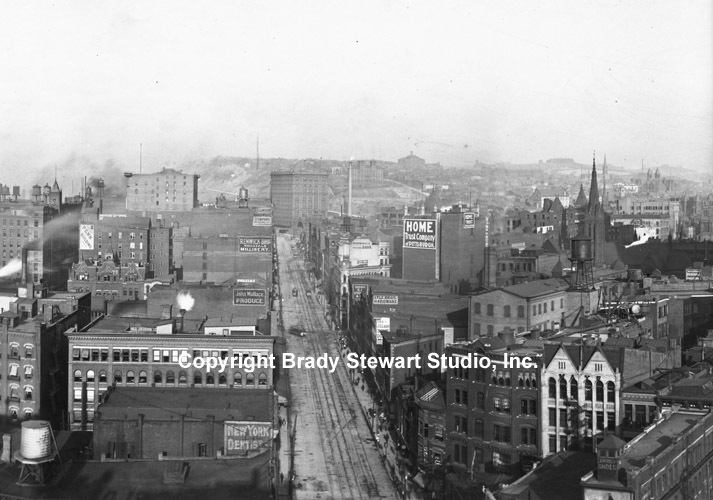 Brady Stewart’s objective was to capture the dramatic changes to the Pittsburgh Skyline during the early 1900s. 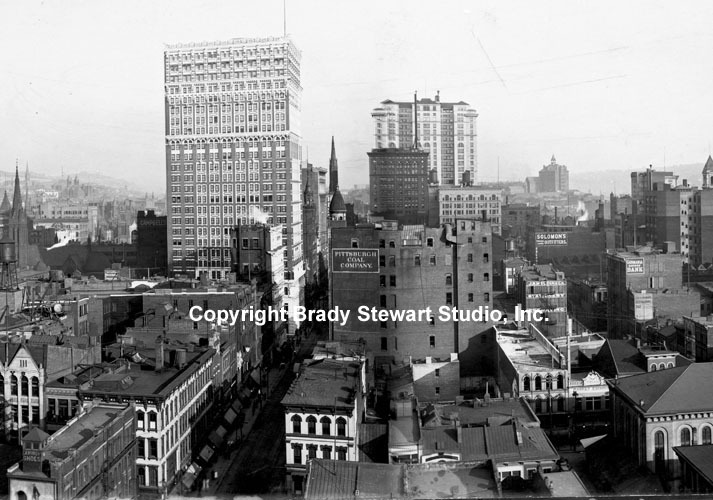 This image included some of the new Pittsburgh Skyscrapers included; the Frick, Farmers Bank, and Carnegie Buildings. Some of the painted building signs included; Pittsburgh Coal Company, J.R. Weldin & Company, Germania Savings Bank, Solomon’s Outfitters, and Geo Reineman’s Restaurant. 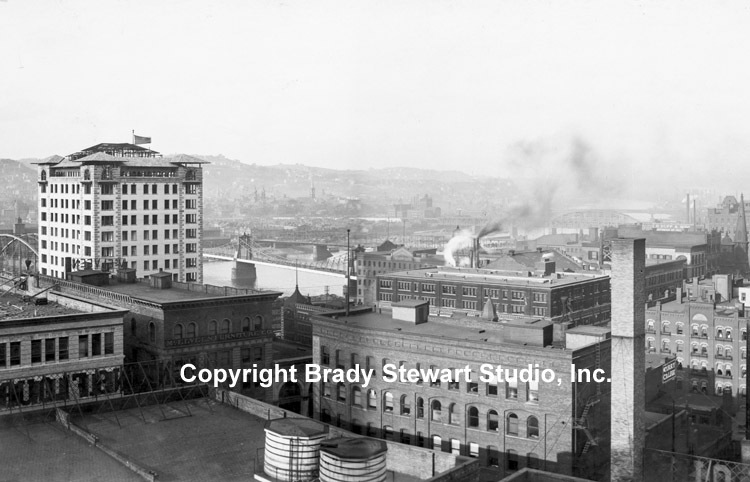 The next image is looking south toward the Arrott Building, Monongahela River and South Side. 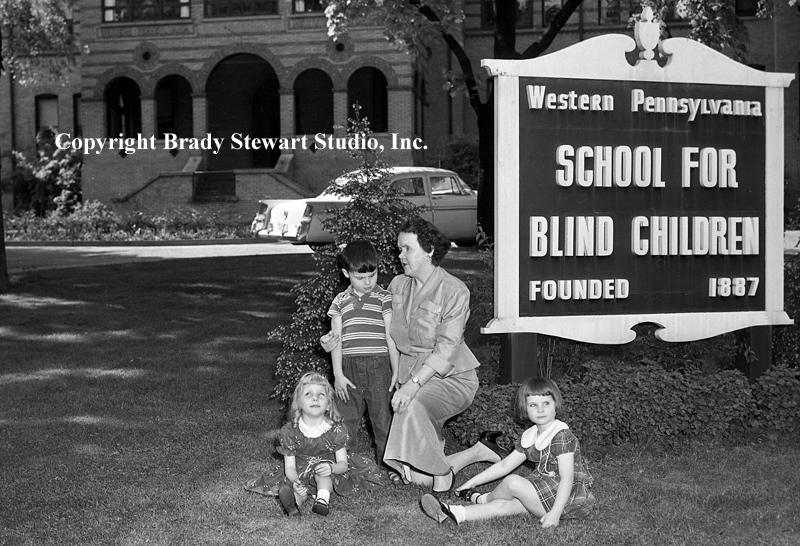 The company signs painted on buildings included; J.R. Weldin & Company, Germania Savings Bank, Solomon’s Outfitters, Geo Reineman’s Restaurant, German Fire Insurance Company, and Pittsburgh Savings Bank. 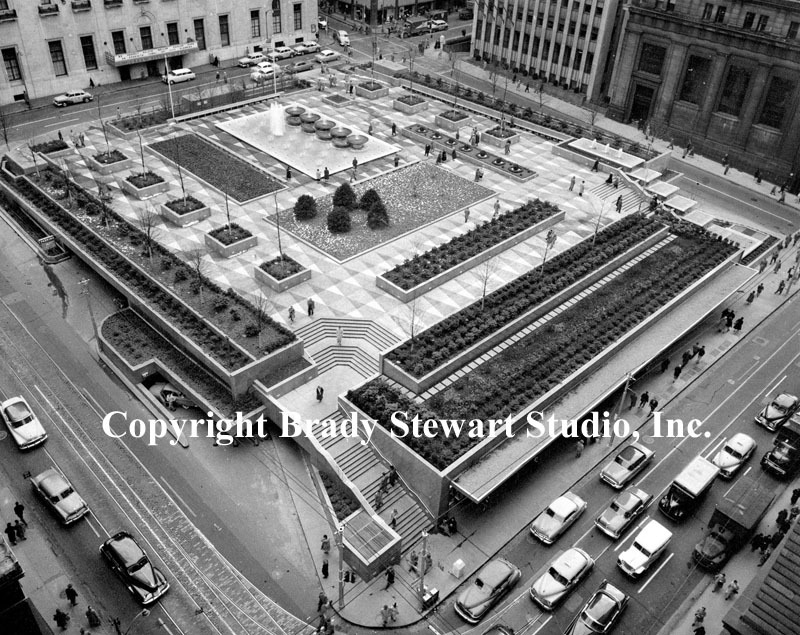 The next image is looking east up Liberty Avenue toward the Pennsylvania Railroad Station. Notice the three sets of streetcar tracks going up Liberty Avenue. Company signs painted on buildings included; C.A Verner Shoes, Pickering Furniture, Rosenbaum Company, Home Trust Company of Pittsburgh, Lyle Brothers Hardware, New York Dentist, John Wallace Produce, Monongahela National Bank, Renwick Brothers Millinery, and J.C. Lindsay Hardware Company. 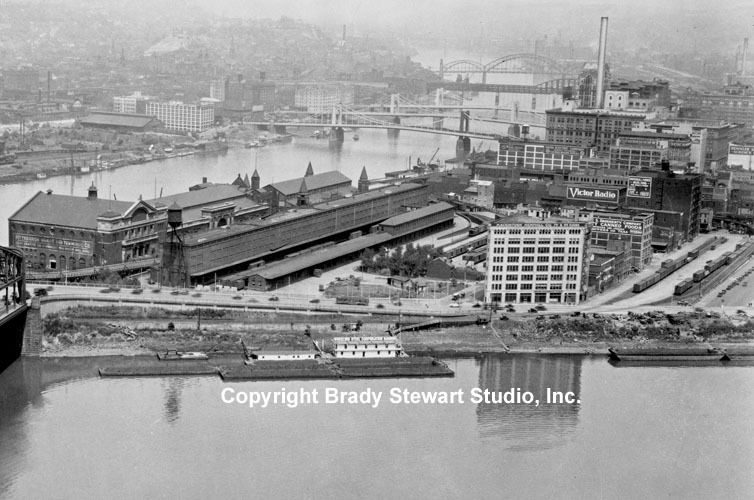 The next image is looking north toward the Bessemer Building, Allegheny River and the North Side. The Bessemer Building was the sister building of the soon-to-be-built Fulton Building (1906). The Bessemer Building was torn down for the Sixth Avenue Garage and the Fulton has been renamed the Bynum Theatre. 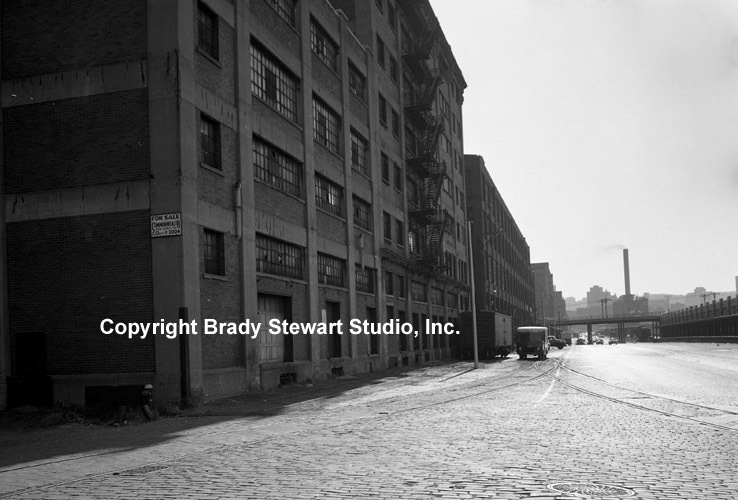 The new images can be viewed at http://bradystewartphoto.photoshelter.com/gallery-list. 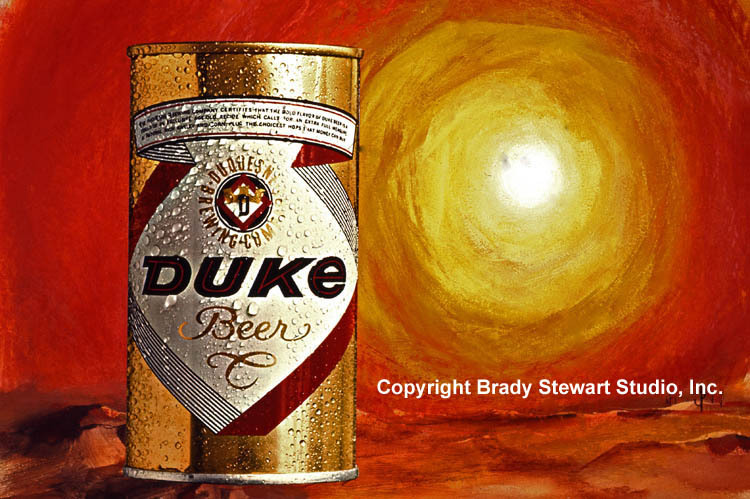 All images in the blog are copyrighted by Brady Stewart Studio Inc. 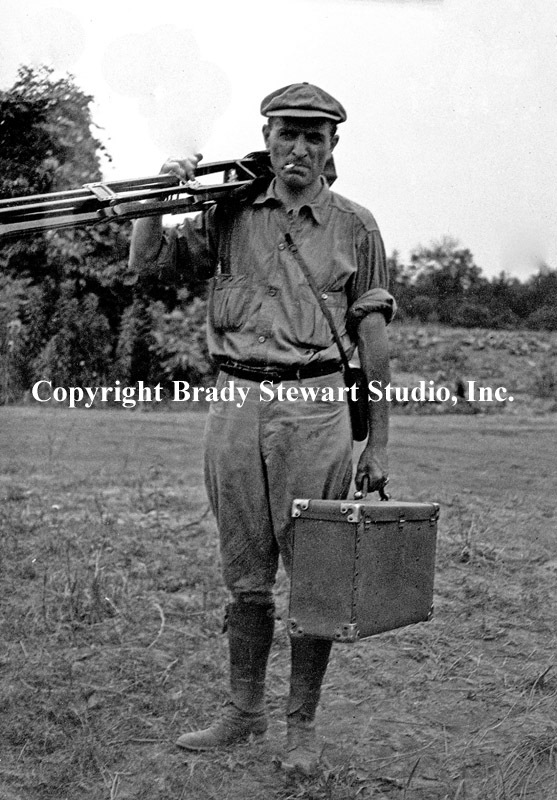 If you are interested in downloading an image or to purchase a print, please contact Brady Stewart Studio by phone (724.554.9813) or email bstewartphoto@aol.com. 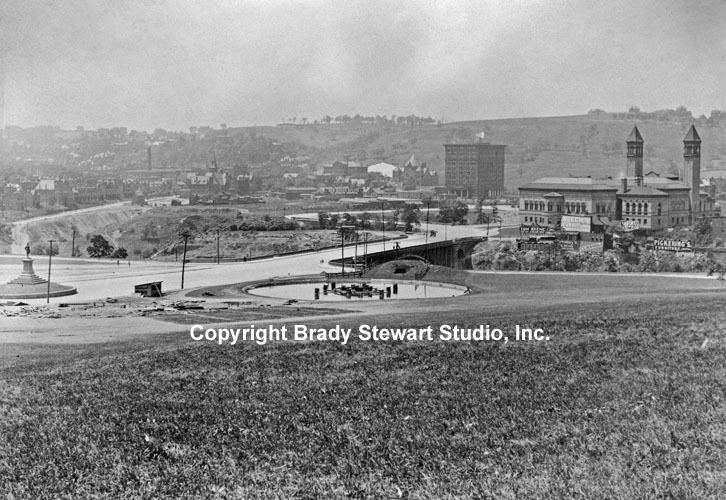 We discovered an excellent image of Schenley Park taken by my grandfather from the top of Flagstaff Hill (1907). The image includes the statue of Edward Manning Bigelow, the Electric Fountain, the Bellefield Bridge, St Pierre Ravine, and the Carnegie Institute. Schenley Park became a reality on October 30, 1889, when Mary Schenley gave 300 acres to the City for the creation of a proper city park. 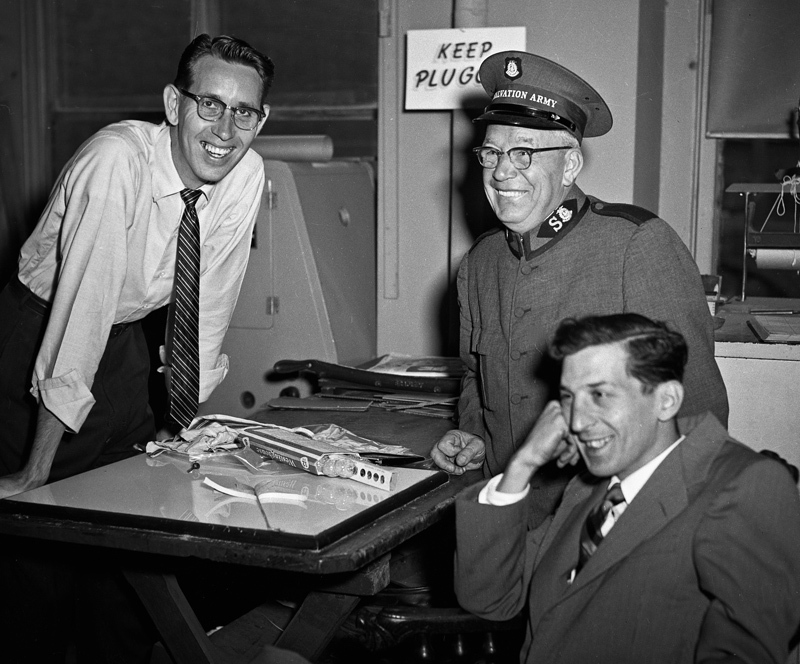 Edward Bigelow, Director of Public Works, was instrumental in securing the land from the Schenley family to create Schenley Park. The first image includes the Bellefield Bridge which was completed in 1897. It was a single-arch stone bridge across St. Pierre Ravine and served to link the outer end of Bigelow Boulevard (formerly Grant) to the spur of land extending southward from the rear elevation of Carnegie Institute. The Bridge was buried at the time of the filling of the Ravine around 1911-1912. 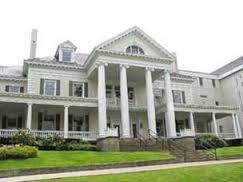 The next image is a closeup of the Carnegie Institute. Dedicated by Andrew Carnegie and opened to the public on November 5, 1895, The Carnegie Library of Pittsburgh and The Carnegie Institute was Andrew Carnegie’s largest philanthropic endeavor, up to that time. The image contains billboards of the following companies and products; Cubanola sheet music, Hershey’s Cocoa, Keech’s Furniture, Pickerings Furniture, Red Raven Splits, and Tom Keene Cigars. 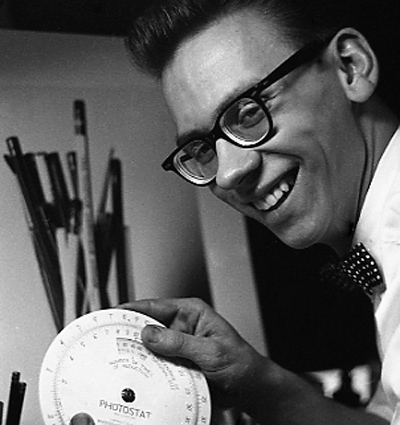 It is easy to forget that during the early part of the 20th century, there were no radio and television advertisements… newspapers, billboards, painted advertisements on buildings and direct mail were the only ways to advertise. The next image is a closeup of the Edward Bigelow statue and Electric Fountain. In 1894, the electric fountain, a circular basin 120 feet in diameter, was constructed at the foot of Flag Staff Hill. The elaborate arrangement of pipes permitted a variable display of jets of water while underwater lights with revolving, multicolored lenses created stunning nighttime performances. 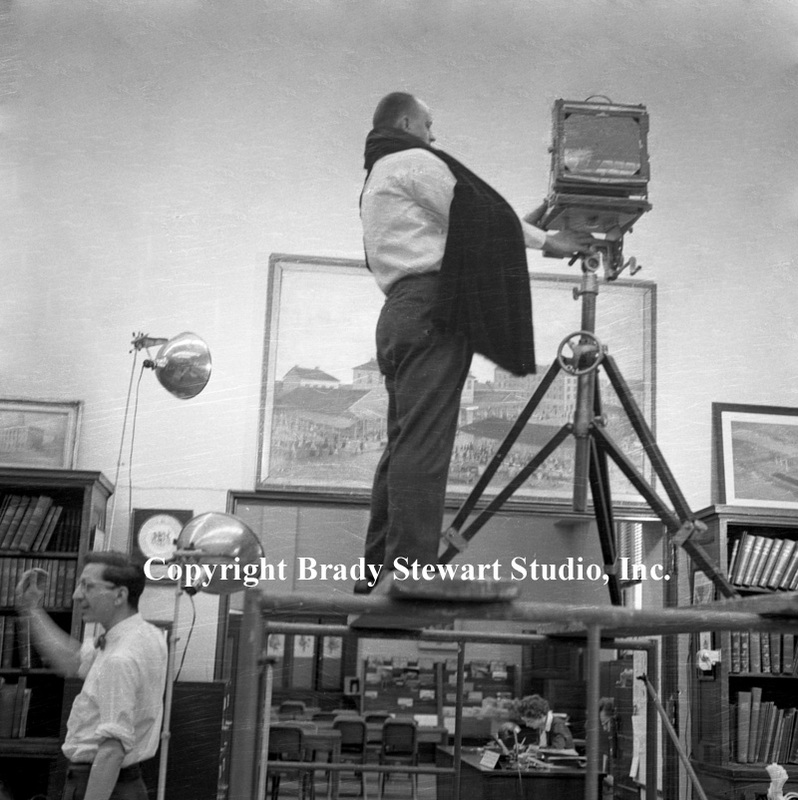 We added 27 new images to the Brady Stewart Collection Archive web site and created a new Gallery – New Images added in February 2012. 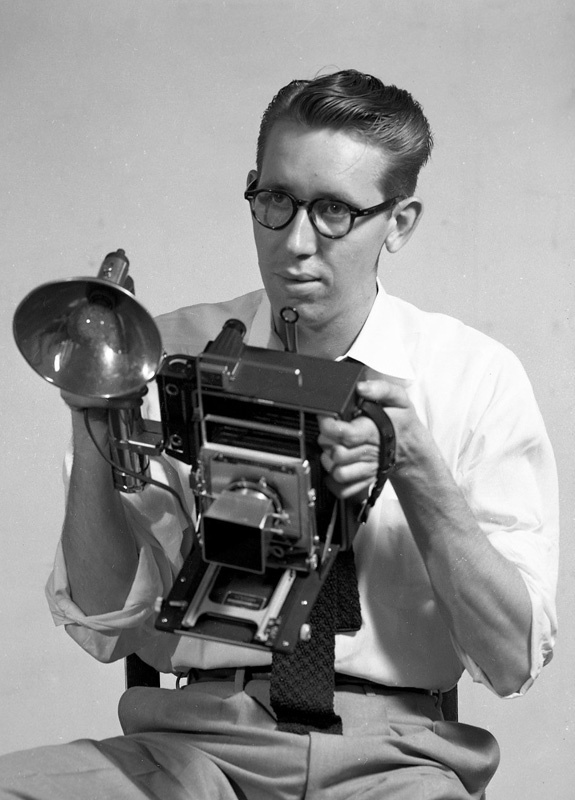 The new images can be viewed at http://bradystewartphoto.photoshelter.com/gallery-list. 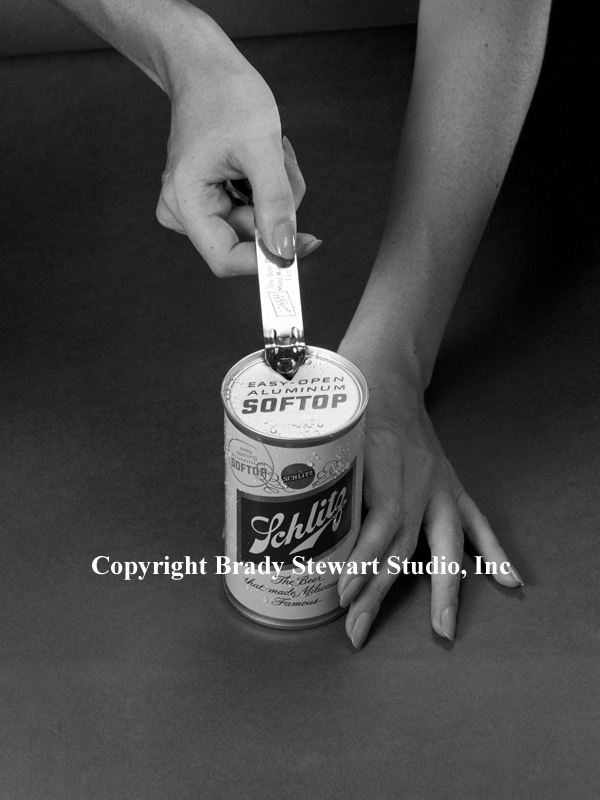 All images in the blog are copyrighted by Brady Stewart Studio Inc. If you are interested in downloading an image or to purchase a print, please contact Brady Stewart Studio by phone (724.554.9813) or email bstewartphoto@aol.com. 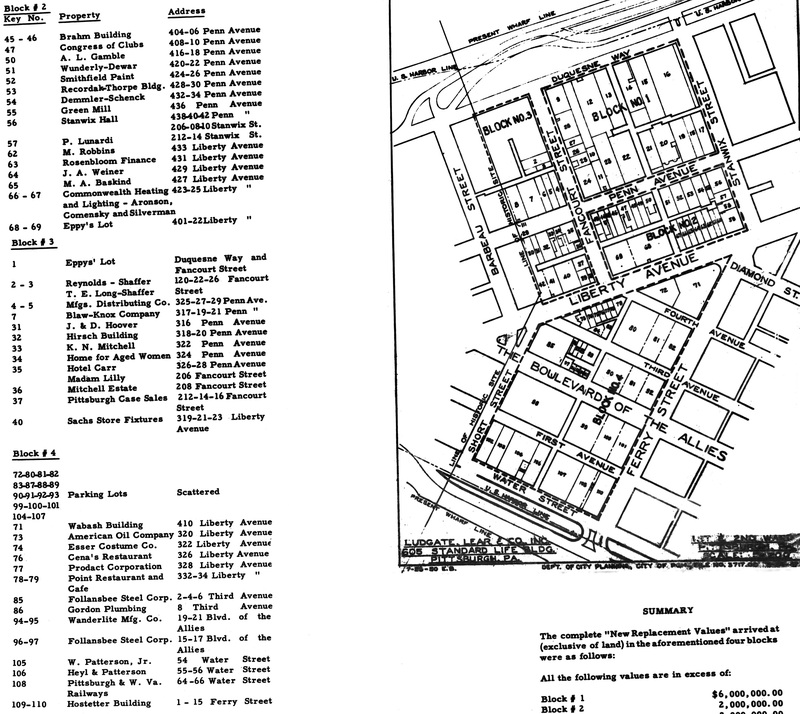 Buildings & Architecture: We have digitized 14 Pittsburgh-area buildings for the collection. 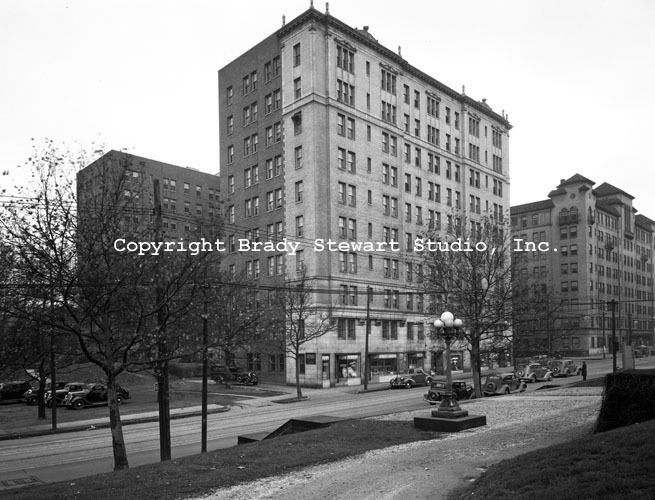 Images include: Arlington & Coronado Apartment buildings in Shadyside – 1930s, Highland and East End Savings & Trust Buildings in East Liberty – 1920s, Westinghouse Electric Supply Company (WESCO) building on the North Side – 1950s, Hardie Brothers and Pittsburgh Gage & Supply Company Buildings in the Strip District – 1940s, Gateway Center One in Pittsburgh – 1950s, Stephen Foster Memorial Chapel and the University of Pittsburgh Nurses Home in Oakland – 1950 & 60s, and the St John the Baptist Church in Lawrenceville – 1950s. 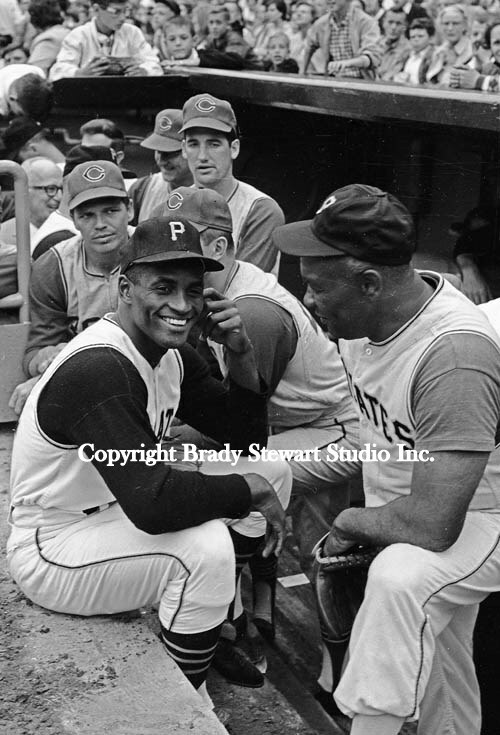 Pittsburgh-Area Sports: We added two images of the Pittsburgh Pirates at the 1964 charity baseball game against the Cleveland Indians (HYPO Game) and three images of the Cincinnati Reds arriving at the Greater Pittsburgh International Airport for a game against the Pirates during the 1960 season. 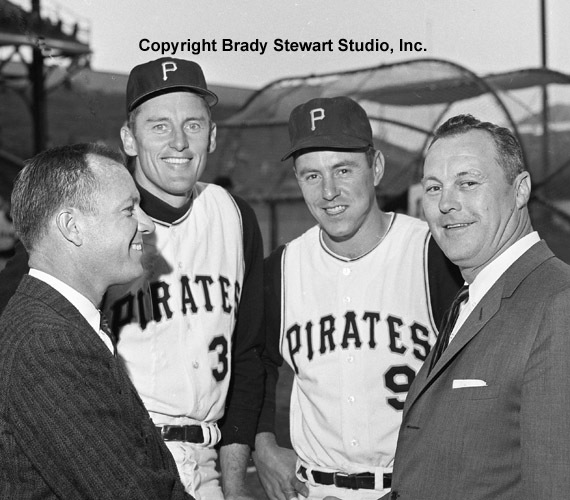 One of the Pirate images include “The Deacon” Vernon Law, and Bill Mazeroski posing for a photo before the annual HYPO Charity baseball game. 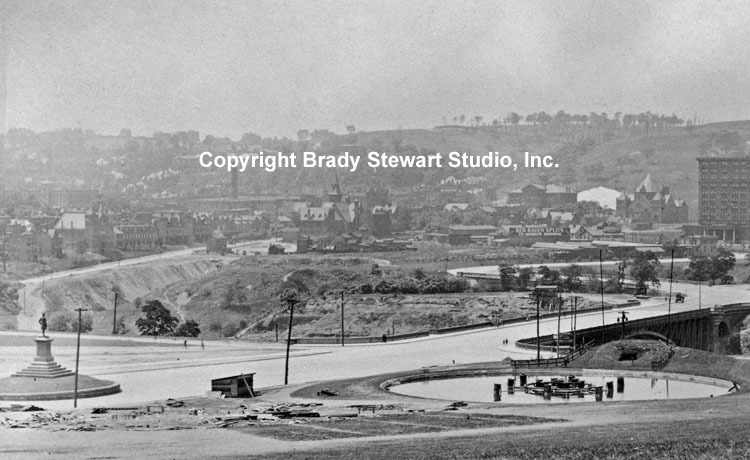 Additional background on the images; Forbes Field was a baseball park in the Oakland neighborhood of Pittsburgh, from 1909 to 1971. 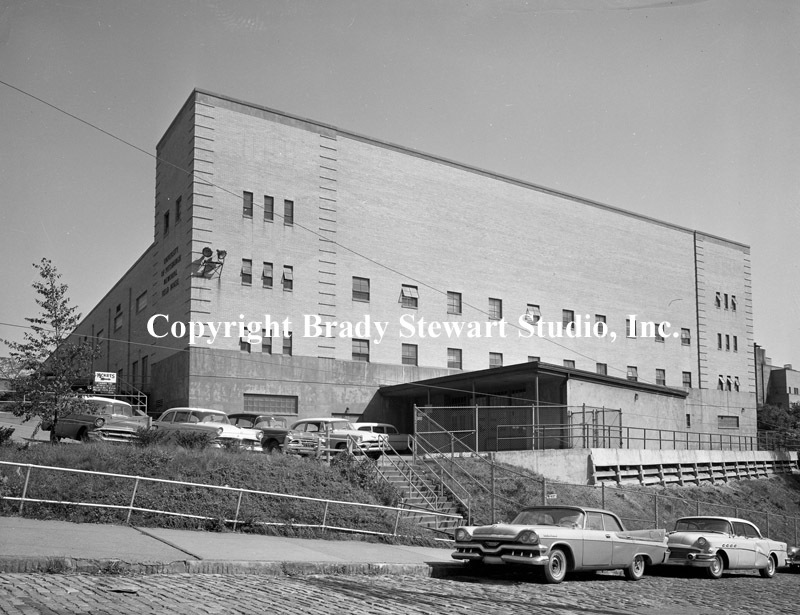 It was the third home of the Pittsburgh Pirates, and the first home of the Pittsburgh Steelers, the city’s National Football League franchise. The stadium also served as the home football field for the University of Pittsburgh Panthers from 1909 to 1924. The stadium was named after British general John Forbes who fought in the French and Indian War, and named the city in 1758. 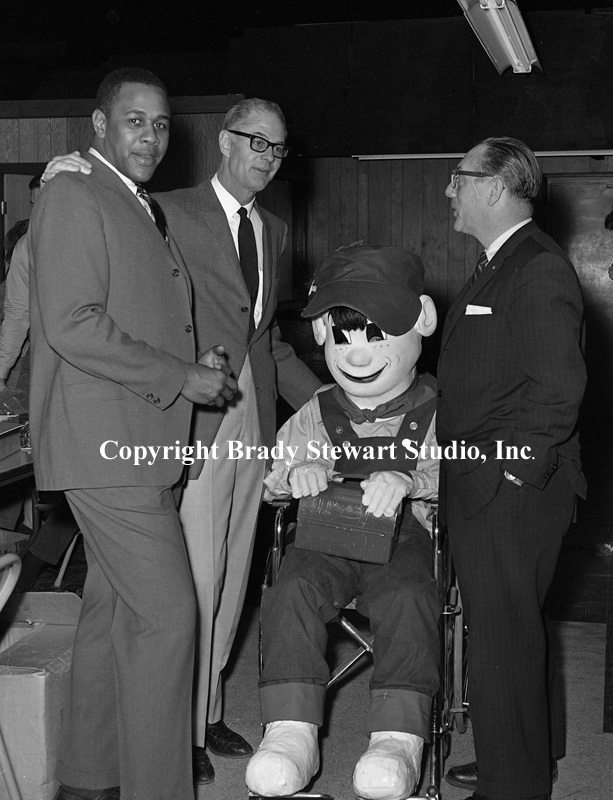 My favorite image is of Bob Purkey Sr. of the Cincinnati Reds arriving at the airport for a game with the Pittsburgh Pirates – 1960. The on location photographic assignment was for United Airlines. The 1960 Cincinnati Reds finished in sixth place in the National League standings, 28 games behind the National League and World Series champion Pittsburgh Pirates! 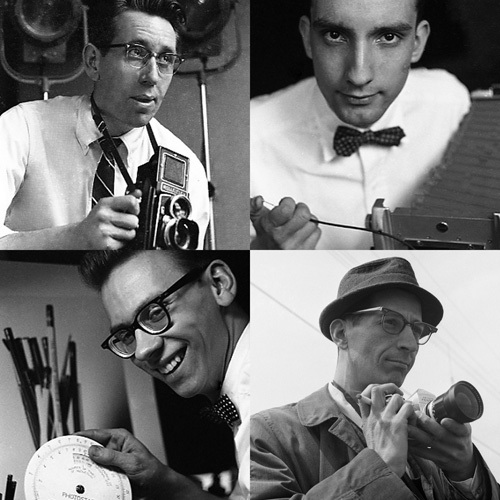 The highlight for me in this set of images was of the one of Bob Purkey Sr. I had the opportunity to know Bob Sr while playing high school baseball with his son, Bob Purkey Jr. For many years, Bob Purkey Sr had a successful insurance business in Bethel Park Pa.
Pittsburgh Business Images: We added 6 business-oriented images that include; two PR photographs of the owner of Samuel B Casey Company in Aspinwall Pennsylvania – 1962. 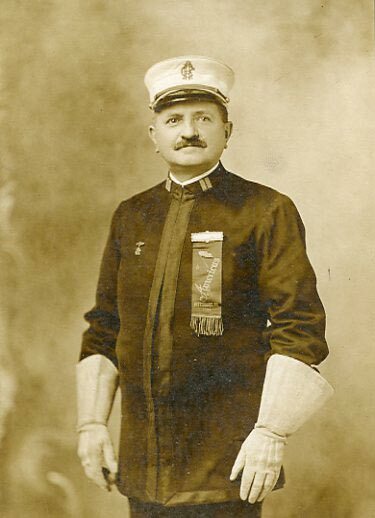 Tee Samuel B Casey Company was a contractor on large commercial projects throughout the region including sections of the parkway; an addition to the former Kaufmann’s Downtown store; a swimming pool at Kennywood Park; and plant expansions for U.S. Steel and National Steel. 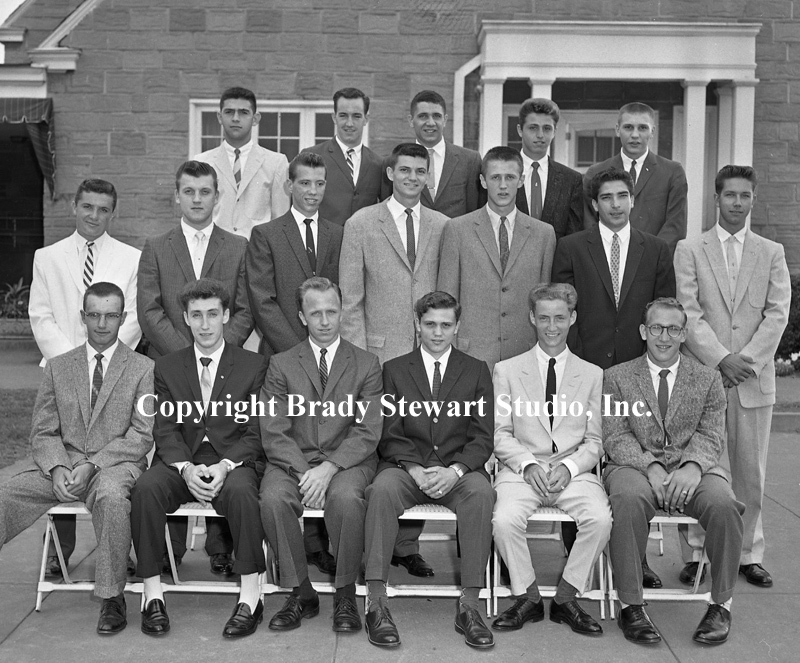 The company purchased Swindell Dressler, another local engineering company, in 1959. Two images of a Saleswoman buying a new car from Don Allen Chevrolet – 1958. 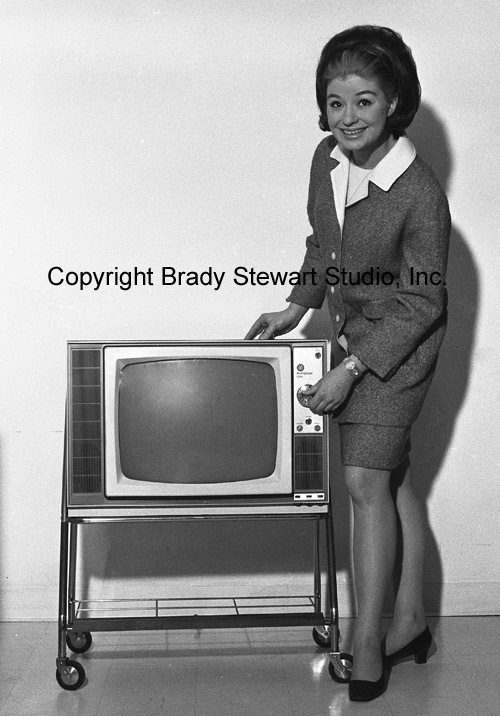 A Relax-A-Cizor salewoman sitting on a new Chevy from Don Allen. Relax-A-Cizor was a medical device similar to the abacizor and many other countless exercise devices on the market that claim to let you exercise while relaxing without effort. 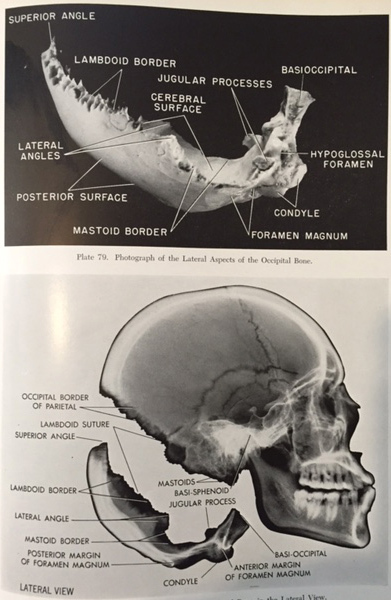 This is one of the early versions from the 1950’s. It is much better and more versatile than the ones made now. These devices don’t work for exercise purposes and many are unsafe. 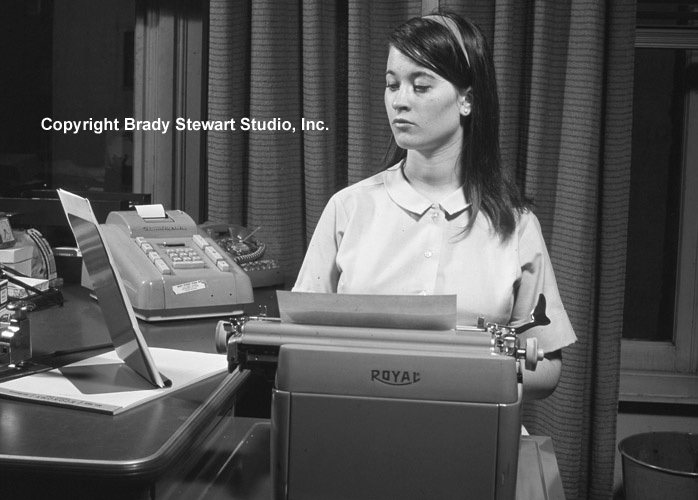 Two views of a secretary typing a letter – 1967. 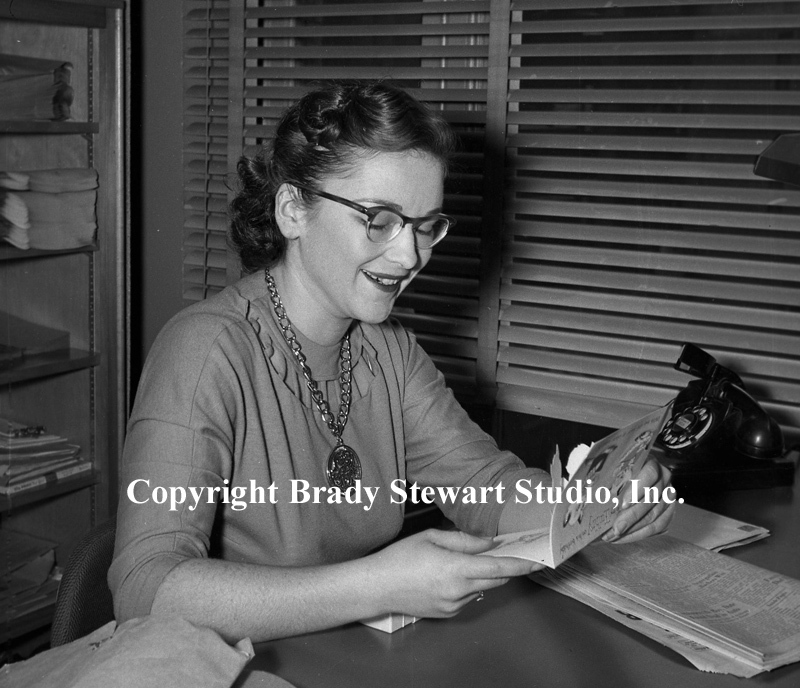 Cathy Stewart working in the offices of the National Union Insurance Company. Cathy left Pittsburgh for New York City in 1969. Over the next twenty years, she established herself as one of the top advertising executives in New York City. Working for American Home Products, a few advertising agencies before becoming the highest ranking woman at Shearson Lehman, American Express (VP of Marketing).